I found an article at golftipsmag.com about hitting longer and straighter drives by PGA instructor Mark Greenslit that advises teeing the ball a slight distance ahead of the club face. The idea is that it ensures you're swinging up on the ball when you hit it. You can read the article for a clearer understanding, but here's the photo from the article. However, what I found most interesting -- and potentially more helpful to many of you -- was farther down in the article in the section called Great Heights. For a draw, tee the ball higher, move it away from you, and play it farther forward in your stance. For a fade, tee it lower, move it closer to you, and play it farther back in your stance. 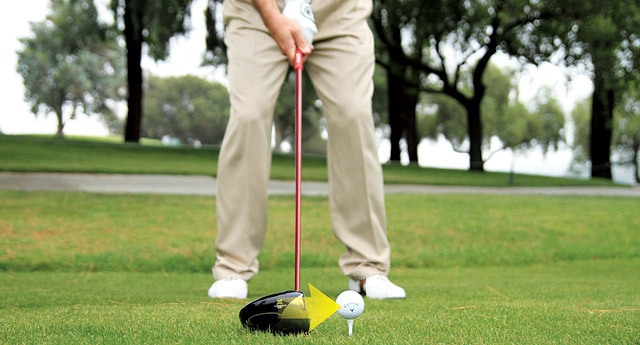 For a straight shot, follow Mark Greenslit's tip in the article and just tee the ball a few inches ahead of your normal setup position. This is something you can try on the range before your next match. Just hit a few practice shots using the recommended setup for the shape of tee shot you'd like to hit. If nothing else, it should help you straighten out your tee shot enough to hit the fairway more often. The Limerick Summary: Goodbye, 2014! Bubbaclaus. Need I Say More?